If you wish to approach the world of climbing or are seeking new thrills, alone or with friends and family, this is the right program for you. This is a program absolutely for everyone from children to families, and groups of any kind. 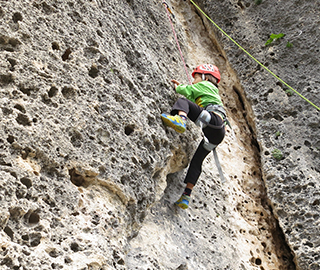 Climbing is something children learn autonomously and spontaneously. An inbred capability that can be improved even as adults, by honing motor skills, either to start climbing mountains or to gain confidence for high-altitude hikes. Our guides will help you to approach your first climbs on easy walls in total safety, to familiarize yourself with the rock, trying to climb and moving vertically, using natural supports and handholds. A fantastic experience to live together, learning to appreciate the tactile pleasure of rock, exploring notches and cracks and testing your skills in finding a vertical balance. Meeting point: meeting in a suitable location and short briefing. Check of personal equipment and sharing out of technical equipment. We will suggest the most suitable crag, based on your accommodation or residence. anything that is not mentioned under "The rate includes"
It is crucial that participants follow all instructions provided by the mountain guides before and during the activities, and that they accept any changes made to the programme in order to guarantee their safety. Fees for lift facilities, transfers and mountain lodges are subject to changes established and applied by the respective owners without any liability attributable to PEAKSHUNTER Mountain Guides. The rates listed in the “The rate does not include” section are to be considered merely indicative and are therefore subject to changes. PEAKSHUNTER Mountain Guides reserves the right to change any route or activity programme based on conditions (weather, accessibility, refuge) and participants’ fitness level. The dates indicated for the activities may change due to weather, snow, or soil conditions, etc. In addition, they depend on the date of opening/closing of the lift facilities, which are established seasonally/yearly by the managing entities of the same and, therefore, are not in any way attributable to PEAKSHUNTER Mountain Guides.